Since this will be my last post for the 2010 year I thought I would post about what I did for the last day of the year. I got the spend the last day of the year with my two BFF's. We all met up at PTM's basement today to play. LTW sold PTM her Gammil when she got her Statler and today was the day she was going to show PTM some tricks of the trade. Here is PTM in one room of her awesome basement getting something out for LTW. Then LTW decided that it would be easier for PTM and would put her more at ease if she did some drawing on paper. She said it helps with the muscle memory and build confidence. So here they are playing on paper. I was sewing while they were playing. I got my 5th LCQAL block done while I listened to them in the Long Arm room. Love how it came out. We worked for around an hour and it was time for lunch and present exchange. I got LTW a Jim Shore cookie jar (she collects cookie jars). I think she liked it! I got PTM a Pandora like bracelet. Then I had cut out a quilt for her! It was the Charming Stars quilt from the Moda Bake Shop. I gave her all the fabric, but it was all cut out. I cut one for myself and one for her (at her house, LOL). LTW Contributed and will do the quilting when the quilt is finished!! PTM was incredibly generous to both LTW and me. I got a new exercise mat, some evergreen spray, some body butter, a really cool square glass dish with a glass lid (I love the antique ones, and this is just like those), an antique blue Ball jar, and some Diana sauce (great on meatballs and spare ribs) all the way from Canada. Sorry no photo, I forgot, but trust me, this was a great set of gifts!! After gifts we went back down the basement PTM got more instruction and I got to do some more sewing. Our monthly, Thursday night quilt group has a basket challenge going on so I had stitched some kitties in a basket and decided to build a quilt around them. The whole quilt has to be made by only you. I have to piece it, and quilt it, guess I'll have to go over to LTW's and use the Statler. So my design has 96 HST around the outside and baskets in each corner. I worked on sewing all the HST blocks and then trimming them to the right size. Then I decided that I needed to try to put the basket blocks together. I wasn't sure what to do about the handles but decided on rick rack. I just took out a few stitches and inserted the rick rack in the HST then sewed it back up. What do you think?? I still need to stitch the handles down but you can see all the HST blocks here waiting to be made into flying geese. While I was trimming all of those HST blocks PTM was busy working on some bindings for me. I had both of these quilts finished for quite some time but didn't have a place for them, or al least for the baby one, therefore no real reason to hurry on the binding. Here are 2 more finishes for both me and PTM for 2010. Thi baby quilt will go to my niece who is having a baby soon. This is one of my favorite blocks in the quilt. So sweet! This quilt I had made for my DD@ but the colors didn't come out very true. It is quilted with silver thread and I love it! It was a stack and wack. Well, tomorrow I will so a little recap of 2010 and something of what I am looking forward to in the new year, but for now, I will wait until midnight and watch the ball drop with my sweetie. I have Jack laying in his usual spot right next to me. My friend, Yuki called tonight from Japan to wish me a happy new year. I got to spend the day with 2 of my favorite people. For now, right this minute, all is right with my world. Sorry it's been a few days since I have posted. I haven't been idle though. I've been thinking about what to post on NYE, cooking, doing unending laundry and such. Today I got to go over to PTM's and play for a little while. I thought I was going to get to do some sewing on a few projects only to realize that I needed to re-cut all the red and white pieces I *thought* were done. Silly me, I didn't do the math quite right, dang it. So PTM and I watched 2 movies, I cut, she sewed binding and we took a little time to sit and watch the end of one of the movies. We watched My Sister's Keeper, so sad, and He's Not That Into You, AWESOME movie. I managed to get all the red and white re-cut, thank goodness. I had cut out blocks 4 and 5 of the LCQAL on Wednesday but needed to cut the next 12 Days of Christmas BOM block, sigh, so much to get done. On top of all that, I need to make a chenille blanket for a baby shower on the 10th of Jan. ACK!! By the time it was time to go, PTM waas taking her dinner out of the oven and I just wanted to get something sewn! I sewed block 4 of the Layer Cake QAL and here it is. I'm very happy with the way this came out. I plan to sew the next block in this series tomorrow. LTW, PTM and I will be getting together at PTM's house for a day of sewing. WE will have our Christmas exchange too. I have to go to the gym first and weigh in. That has not been so good recently. Since the first of Dec I have gained 6 pounds back. I plan on getting back on track for the new year. I'll take lots of pictures tomorrow so you can join us in the fun. After that I plan on a post about the upcoming New Year. Original huh? HAHA, I know but it helps me to focus on things. Until tomorrow. Sizzix Pro VS Accuquilt GO! I just heard about the Sizzix Big Shot Pro machine and how you can use it for fabric not just for scrapbooking. It looks like it will use the GO! dies as well as all the Ellison and other scrapbooking dies out there. Has anyone used it? What did you think? Since the GO was on back order I have an opportunity to choose between the 2. So far, from what I have heard, I'm leaning toward the Sizzix. Any input would be helpful! I saw a quilt on my friend, Sophie's blog and I was so excited about it. It was of Bevo, the University of Texas's mascot and it was gorgeous!! Pop over to her blog and visit, she is the woman that runs Block Lotto (as seen in Quilter's World magazine. Tell her I sent you! 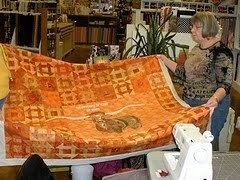 Any way I borrowed these pics from her blog to show you the quilt. Isn't this gorgeous? Well Sophie knew I would love it and she offered to send the pattern to me!! It arrived with a darling little kitty card too and she sent it as a gift! Look how different it looks in the pattern. Now I have to think about how to make it my own, right? On top of that, Kelly over at Charming Chatter told us that Mrs Claus was looking for inspiring stories so I sent her the story about my friend that went through so much adversity this year but never lost her positive attitude. Also I told her about my family. I think you all know that story but briefly, I have 2 sisters, the older one was born retarded (mom had the measles during her pregnancy) and the sister is also schizophrenic and bipolar, the younger one has Cerebral Palsy, she is the one that came over for Christmas and she lives with my dad. Anyway there are the 3 of us, we are still waiting to discover my handicap, LOL. (It's ok to laugh, we say this in my family and we all laugh). Ok, long story short, Mrs. Claus chose my story so I was a winner! She asked me to send her some of the things I liked and told me she would send me (and my friend if she was a quilter, which she is not) a nice fabric package. Boy she wasn't kidding! Thanks, Mrs. Claus!! What a huge package of fabric!! I took my machine in to get tuned up, just like I do every year so no sewing going on here at the moment but I think I may be able to do some cutting and maybe some sewing on Wed (yes we have Wed night sewing) and Thursday, I will be going over to PTM's to play with her and LTW!! I have a lot to do so will see how that goes. I need to do my layer cake block probs the next one after that by then too, the next JR QAL block and my 12 days of Christmas block. In addition, I need to work on my "basket" quilt for the Piecemaker's challenge. I still have some cutting to do on that one too. YIKES! Maybe I should put Christmas away this week too so I can get all the sewing stuff out? WE are supposed to have some warmer weather soon, so it may work out. Tomorrow is going through the closet day (I hope). What are you up to this week?? Christmas morning was an amazing day here at Chez Lincoln! My father and sister came over around 9am and we started to open our presents while the breakfast casserole and cinnamon rolls were baking. Here is a little peek. DD1 and my little sister. A few years ago our family took a vacation to the Smokey Mountains. We stayed at a cabin in the mountains and one night the lights went out. We were looking for candles and couldn't find any so the kids made up a candle thief named "Marcos". They drew a picture of him and wrote about him. My DD1 was cleaning out some things recently and found this sketch, so she framed it and gave it to DD2 for Christmas. We all cracked up! I didn't know what to give my dad for Christmas. He is 84 and he has what he wants or buys it. Sigh. I knw he is always cold so I bought him some fleece lined jeans, which BTW he loved. I know he is cold at night so I decided to give him a flannel quilt that I had at home that didn't fit on my queen sized bed. He is opening it in this first photo and do you think he liked it? Then every year I give my DD2 a "creepy elf" and this year was no exception. I actually found more than 1 this year but here she is with one of them. We gave my son that crazy hat that looks like a mohawk but in hat form! He loved it and I'm not sure he has taken it ouff since he opened it up! I didn't happen to get any photos of my DH or myself but I assure you we had a wonderful Christmas! He bought me an Accuquilt GO! cutter!!!! Except where he tried to get it from it was backordered so he had to think fast. He had my daughter consult with LTW, who gave her the box from her cutter and my thoughtful DH wrapped that box!! He told me I can order the cutter, the case and a die or two!! Am I not the luckiest person ever?? I am going to try to get PTM to order hers at the same time! From my kids I got, Victoria's Secret undies (DD2) and a gift certificate for a pedicure as well as a certificate to get my ears re-pieced (the holes closed up). DS told me he had ordered something but it didn't arrive in time. My sister gave me a GC to JAF, dad gave me a nice check! DH also gave me the shoes I found in Shipshewana, a new piping foot for my Bernina, some bobbins and a Sietz oil lamp and a few little things. See what I mean? GREAT Christmas. Notice that little tree on his left? See that paper angel on the top? DD1 made that years ago and I love it. My kids HATE that tree!! They hang all the kid made "ugly" ornaments on that tree. We had a funny moment when I took out the cake I had bought at the local bakery. DS likes "bumpy cake" so that's what I bought. My dad took one look at the cake and asked me if I bought it all lumpy like that and just what exactly was in those bumps? I told him bugs and yes I bought it that way! Actually it's cream. LOL!! Oh dad! I hope you all had a wonderful Christmas too. More soon, I've been working on my New Year's resolutions and my look back at 2010. Every year we go to my SIL and BIL's house to celebrate Christmas Eve. This year they were in a new home in Jackson and it is an amazing house. I am not going to post all my photos on the blog cuz I took so many but I will share a few. First DH and I brought Gingerbread cookies for all the little kids to decorate. We usually bring them a craft of some sort to do. They seemed to have a great time. This is just one of the staircases. Isn't it beautiful? DD2 and her BF along with some of the family. DD2 and her BF and DD1 and her BF, it was nice both of the BFs could join in the fun! Then we got a great photo of our whole family with both of the BF's. Here is a great pic of DD2 with her Aunt Margie. They share a birthday. Also Margie's DH with a bottle of wine that my DH found for him with his company's name on it, CMS. Last but certainly not least a great pic of my DH's brother and SIL. Thanks Mark and Jackie for a wonderful night!! I will tell you all about Christmas tomorrow. I hope you all had a wonderful Christmas and that Santa was very good to all of you! First of all I would like to wish everyone that celebrates Christmas a very Merry Christmas. I am just about ready for the big day tomorrow. Last night DH and I baked some gingerbread cookies to bring with us today for our nieces and nephews to decorate. Every year we bring something for them to do. I have to say making gingerbread cookies was a brilliant idea, so easy. I used a gingerbread recipe from my friend Cori and it was fabulous! Anyone need that recipe?? Earlier in the week DD2 came home and her friend, Andy, came over and they decorated the sugar cookies. Anyone else use the frozen ones from Gordon Food Service? I love these cookies! I did manage to snap a few pics of them. This is the second year Andy has come over and he said, "Hey I came here last year, right? So this is kind of a tradition, right?" Yes Andy it sure is. I am so happy that even though he is home from his military training for a few days he spent some time with us! Whenever Andy comes over it means apple pie time too. He loves pie. As soon as I knew he was coming over I set on making a pie for him. Now on to something I wanted to do for myself. 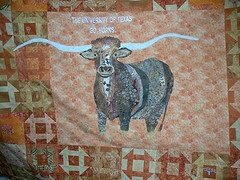 I will be changing the list on my side bar and removing the finished quilts. I did that last year but I didn't document here in a final post, all the quilts I had finished in 2009. I decided that I need to do it this year so I went to bighugelabs.com and made a mosaic, using photos from my Flickr account. Here it is! I think I counted 16 finished, although there were 2 of those veteran quilts so maybe that makes 17. I didn't put in any of the embroidered blocks, or quilt blocks or tops, just the finished projects. Not too bad, huh? I hope you all have a wonderful holiday! Mine begins very soon. A little birdie told me that Little Miss Shabby is beginning a BOM that looks like it is going to be adorable!! I put her button on my side bar. Go on over to her blog and see what the scoop is. I love the little "peek" she is showing of it. She is using the Sun Kissed line but I think I may use a different line. Anyone out there want to join in and play with us?? I really need to get off this computer and do some wrapping. The furnace guys showed up and have currently taken out our old furnace and are now putting in a new, energy efficient furnace. It's a little chilly in here for the time being. I have loads of bins in my living room from the basement. Now my LR looks like the basement! LOL. A great little giveaway is going on over at retromummy's blog of some luscious fabric. Go take a look! Remember that I won a darling gingerbread apron? The other day, my DS was trying to pour hot soup from a big container into a Thermos without splashing on his good work clothes. I told him he needed to put an apron on and guess what he grabbed? You got it. With that, I leave you and I'm off to do some wrapping. This will tell me where the gift holes are. Hopefully there are none! DS's birthday is the day after Christmas too so have to save out some stuff for his bday. Have a wonderful day. Today, DH wanted to go to the Dickens Festival in Holly Mi. I love going but not so much for the festival but for the amazing antique shops. I always manage to find some creepy elves for DD2 for Christmas. I also started to collect these porcelain headed, angels. It's too dark to take photos tonight but I will do it tomorrow. I believe they are Japanese. I had one when I was growing up and happened to find some others when we have been in Holly. I went to the gym first, came home showered and we had asked PTM and her DH to join us. They came over and we all went to Holly. We had some great finds today. I think it was especially fun for the guys to finally meet and spend some time together. It's interesting that they seem to have quite a few things in common. Antiquing is one of them. We found 2 cast iron muffin pans and my DH had been looking for those. My favorite thing that I got was another angel a BIG one. I managed to get a photo of PTM in front of the Holly hotel and then one of her and her DH by the horse drawn carriage. I think I've shown you this before but they have 2 amazing vampire hunter kits. They are so cool and pretty old (circa 1860). In addition to that they had a werewolf hunters kit too, complete with Wolf's bane and silver bullets! They were a little out of my price range! We left around 5:30 and headed home. We decided to stop at our favorite place to eat, Chopstick House for dinner and then they dropped us off at home. DH and I watched A Christmas Story and now it's time for bed. It was a wonderful day spent with good friends. Bring on the holiday! Friday after the FNSI was my lab Christmas party. It is always at my boss's house. They really decorate for Christmas. Here is a little of the decorating. This just happened to be on their counter. I think it was one of my favorites this year. They always get a gigantic tree too. Both my boss's wife and I collect Analise elves and stuffed animals. I think of them as a little creepy which is what attracts me to them. She has this silver tree with elves all over it. You can see it from both sides. It is always a good time and we do our Secret Santa final presents. I figured out who my ecret anta was this year. I was pretty sure it was my friend, Hiro. He gave me some wonderful gifts over 2 weeks but he gave himself away. His final present was so creative. It's fun to see people from other countries and cultures first learn about SS, then, just about the time they have to go home, they really "get it" and have a BLAST doing it. You all know how much I love MSU and that I work at the "other school" (U of M. Thr first gift was a drink cozy with the block M on it. Then some u of M and MSU fabric to make a quilt with, he even included the "pattern" which was GO BLUE, GO BLUE, GO BLUE with teeny tiny MSU blocks in the corner. So funny!! Then he gave me a bottle of wine called FIZZ. Funny because I made some antibodies for him that were directed against a protein called FIZZ. He also thanked me for all my help, for being his friend, for making Yuki one of my BFF's and for being his "walking dictionary", LOL. Anytime he had an English question, he would ask me about it. He is going back to Japan soon to join Yuki and their new baby. WE see many people come and go through the lab but I will really miss them both. It was never a chore to help Hiro he is genuinely a great guy and I am so happy to have them both as my friends. I will miss them both! I am very lucky to work with one of my best friends too. Neither of us like to have our picture taken but we did manage to get one. There are more photos on Flickr if you want to see more of the party. It was a great time!! Thanks Steve and Robin! !